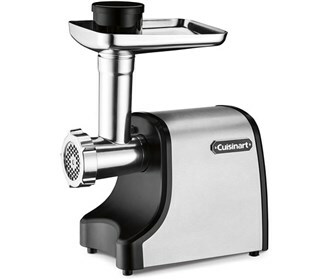 The Cuisinart MG-100 is an electric meat grinder used for effortlessly grinding a variety of meats. The powerful 300-watt motor quickly grinds meat up to 3 pounds per minute. The grinder offers 2 cutting plates for medium and coarse thickness, as well as 2 sausage attachments for breakfast links and regular sausages. This grinder has a reversible function that releases clogged foods which helps for smooth working of the machine. The Cuisinart MG-100 has many exciting features for users of all types. You can extend the lifetime of your Cuisinart MG-100 with the purchase of a FactoryOutletStore Factory Protection Plan. 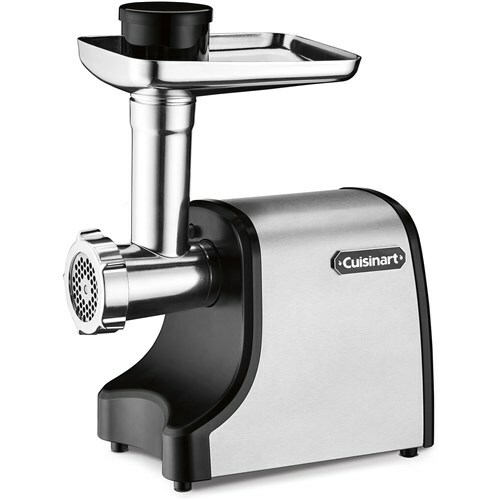 See the Cuisinart MG-100 gallery images above for more product views. The Cuisinart MG-100 is sold as a Brand New Unopened Item.